We are now on day 10 of our 12-day celebration of Richard Armitage as Guy of Gisborne. Today’s screencap was suggested by Mamma_T. Her image comes from Robin Hood season 2 episode 2. In fact, one of his favourite scenes in this series is one with Keith Allen, “where the Sheriff is bathing naked in a bath and stands up out of the bath. 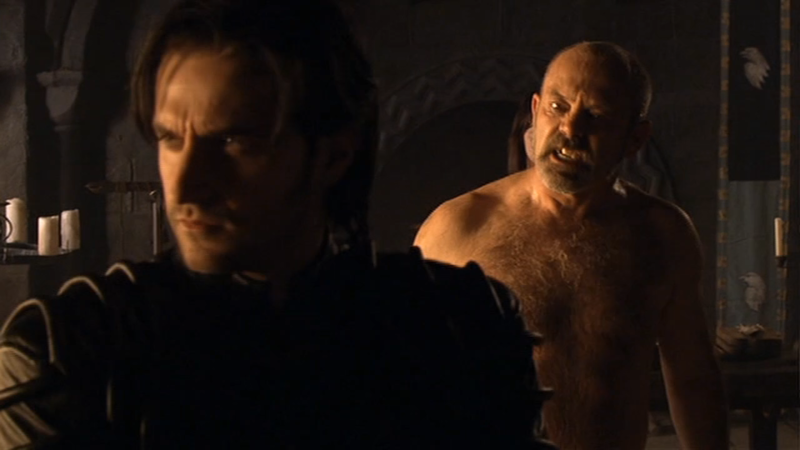 And Gisborne is just horrified having to be so humiliated to have to stand and look at the Sheriff’s private parts. It’s the ultimate humiliation, so I found that quite amusing to film. And actually to watch back, it’s very funny.”) ((from Annette’s site). Thank you very much for your contribution! For today’s activity, we have an interactive comic book. Please click the image or text link below. EDIT: I changed the comic book a bit to make it look nicer. Thanks for your helpful suggestion, Alfie! By the way, the little comic book on the front page is interactive. You can flip the pages if you click in the bottom right hand corner of the comic book image. You might need to refresh or reload the page to see the changes. This entry was posted in Animated GIFs, Fan Videos, Graphics, richard armitage and tagged animated gifs, fan videos, fanvideo, graphics, guy of gisborne, keith allen, richard armitage, richardarmitagenet, richardarmitagenet.com, richardarmitagenetdotcom, robin hood, sheriff of nottingham. Bookmark the permalink. Thanks, MammaT for one of my fave bit of Guy/Sherry! I adore the comic book. It’s something inspiring me to be a silly teenage again! BCC, I confess, my fragile heart had a *thud* at page 1 when I read: “I’ve been waiting for you, Cassia”….. Same thing with me with Guy said he’d been waiting for me, *sigh*. WOW, this is so funny! Fantastic!! You are brilliant, bccmee!! Oh dear sweet Guy, I’ve been waiting for you too…thud! This is really good Bccmee, sad to think only 2 days to go! How cool is that? It kind of reminded me of the John Lennon Artificial Intelligence Project. Anyway, I always thought Guy needed a thought bubble or two…lol, great job bccmee and Mamma_T! Bccmee, you’re brilliant. What a great fun. My heart trembled from the first page of this comic book. LOL! That was a lot of fun. I loved the sequins vs leather photo shoot screen, funny. Very good choice of screencape Mamma_T I love very much this scene too , Guy is so funny. Sometimes in the show Vasey is very sexually ambigu with Guy (poor Guy). Bccmee all your projects are great but this one is one of my favourite. It’s so good to talk with Guy (especially when he says that he’s waiting for me…). You are a tReAsure! As Jo says “this much fun should be illegal”! I have to send you a copy of the last caption (it made me very happy indeed). I also like the fact you made my age turn into a good thing! Thank you so much, B! it’s a delight to see one of my favourite scenes among the 12 days of Guyness! Great fun Bccmee and MammaT! That was fab! Thank you, Bccmee! “My Guy” likes to gardening with his shirt off…wow, hihi. Love It! Fantastic! The first one about bathing was a corker–to use the Brit vernacular. Pictures and captioning options were super funny. This is so much fun Bcc!! 🙂 I loved that scene with Guy and Vasey! The “Pat, don’t rub!” comment and the expressions that Guy used were simply priceless!! I’m amazed they managed not to crack up while they were filming it but who knows what went on behind the scenes!! Too funny!! Each day when I check on your blog to see what you’ve come up with I think you can’t possibly surpass what you did the day before but you have!! I’ve tried it a couple of times with different answers and it makes me laugh so much. It’s great, and it starts well, that would be great if we could hear the sound of his voice pronounce my name, bravo Mamma_T and bccmee ! Oooo love this! I would love to smell Essence of Guy even if he does only bathe once a year! I really hate for this fun to end! Thank you so much for my daily laugh! Hi, Bccmee! Sorry for not sending you any feedback lately. Oh my! There are so many posts about Guy. I’ll try to read them all to be updated. By now I can say that I had a lot of fun with this interactive comic book. You’re getting better and better at you computer skills. That’s for sure! Congrats!!! By the way, I loved the snowflakes falling… beautiful! Have a nice Sunday! Always wonderful surprises!!! Impossible not to love them… Thanks!!! Oh,I love this, Bcc,it was very,very funny and a lot creative.But I loved especially the first and the last sentences.How I´d like to hear this from own Guy lips. BTW, how can I save it in my pc, PLEASE…!!! Love the comic book, it was so much fun. I agree with Tereza, having Guy say he was waiting for me *swoon* LOL! @Everybody: Glad you enjoyed playing with our interactive comic book. 🙂 Sounds like there has been a lot of interactivity going on, LOL! Thanks to Alfie for her helpful suggestion on improving its appearance. I absolutely love hearing your hilarious input for the comic book! I’m laughing and trying out your captions. 😀 😀 😀 You all crack me up!!! LOL!!! This was so much fun!!! I loved it! I’m sorry there are only 2 days left! That went by too fast!! WOOHOO this is hilarious and so much fun! Thanks! !